I stand corrected. I checked my tech tree closer and you are right. Extreme Colonization is NOT there. The two techs normally immediately before and after EC are directly connected. In my first game with 3.6, I happened to have zero Extreme Planets in range. I captured a couple from an AI that colonized too close to me. It should be an easy fix for Stardock. This is why they provide preview versions. Ok, so you both are on the opt-in an are seeing this issue then? Link to a save game (with any repro steps you think would help) to a cloud service (Google Drive, DropBox, OneDrive, etc). List out the DLC you have installed and any MODs you are using. Any custom races being used (files)? When you do, we will take a look and thanks for the report. I'm not sure how QA could miss it. A check of the master tech tree for 3.6 shows the problem readily. Planetary Improvement has two possible branches (XenoAdaption or PlanetaryEnhancement). The non-synthetic branch goes XenoAdaption ==>Environmental Engineering ==>ExtremeWorldColonization ==> ColonialEngineering. The synthetic branch goes PlanetaryEnhancement ==>ColonialEngineering. I find the tourism thing hilarious. Just want to add a quick bump to P-DEXTER request at the top of the thread. A “don’t include in random” option would be great. As much as I do like the Star control Aliens (would love to see more BTW) I would still like to setup a game with random opponents just from the Gal Civ cast. Frogboy mentioned that the Aid Research was nerfed to only occur on the planet on which the Tech Capital was built. It is intentional, not a bug. Then by the same logic he should nerf Aid Economy to only occur on the Financial Capital planet. I don't understand what he thought he was trying to fix. 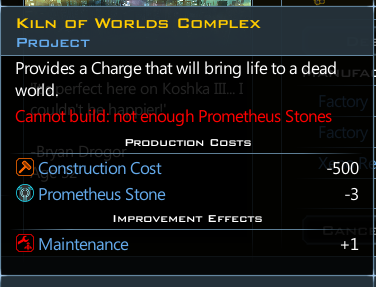 Prometheus Stones were removed from the game quite some time ago. You can only mine Promethion. It is currently impossible to recharge Kiln of Worlds. We have this fixed internally but it didn't make it in time for the patch. We'll push this out soon. You guys are awsome. This iteration of the game is really good! IIRC, he mentioned that the point was to shift mid-late game planetary projects to income instead of research (pretty sure this was in one of the Retribution Journal entries), and he bumped the bonus for the Aid Research project up. This actually doesn't bother me. It would be logically consistent if Aid Economy was shifted to require the Financial Capital improvement, but I'm not sure what "idle" planets would do in the mid-late game. Perhaps there should be a Ship Building project (military production) unlocked by the Shipyard improvement to convert social to military? Such a thing already existed before, can't remember when it was removed. Sometime around Crusade maybe? I'm trying to remember that but can't... and I'm not necessarily advocating for a military project, but I'm not necessarily 100% sure about switching to Aid Economy almost exclusively, either. I assume you are talking about the synthetic's inability to colonize extreme worlds because of Extreme Colonization tech missing from their tech tree. I tried with mods, without mods, with my custom synthetic race, with the Yor and the result is the exactly the same. The master tech file shows exactly why. I am losing confidence in Stardock to be honest. The state of Retribution at release was awful. I'm willing to stick it out for the long haul, but the more casual player will probably move on. Brad, you seriously need to review your QA team. They have made an otherwise great expansion less than it deserves to be. I think I found another bug, where I think the ”Xeno economics” research should be there is nothing it seems like there is a hole in the tech tree and unless I’m just stupid it seems as synthetic life are unable to use information oligarchy unless this is by design. This is the third government I use on my progression path. Also im ignorant of coding / programming / game design but if the governments colony limits were based off of total number of habitable planets I feel it would allow a smoother transition during the growth phase and not pigeonhole you into certain government types in larger maps sizes. I am having fun playing the newest expansion glad synthetic life is back to being mostly fixed. +1 to no extreme colonization and an inability for synthetic life to colonize aquatic, corrosive or frozen worlds. I feel like the resources on the maps are a lot lower than before coupled with the hammer taken to tourism has slowed me down considerably I use to just bulldoze my way to the top. I turned down the game from genius to normal while I get a feel for it but I wonder if I will be capable of zerging the game in the later stages it may force me to play the entire game instead of spending the last 100 turns yelling about not having enough legions to finish the AI before giving up the dream of a conquest victory and finishing another way. i mean my murderous machines just tend to get impatient. In the meantime, you can take it as a trait on your custom race. Just mod in an extra ability point since it's easy to do. I believe you can also trade for it. I’ve never modded this game and I’m not sure how to do that although that would fix this. Sorry for the problem, I can see what the problem is now, but I am still trying to figure out the best way to fix it. But we should be able to have it fixed in the next patch. No worries I’ll wait for my “friends” to colonize them and then acquire them. Appears to only happen when the consulate is touching something else that has tourism income. Doesnt happen on a world without tourism. And doesn’t happen on a world with tourism unless the consulate is touching something that has tourism income. The recent patch notes mention “Fixed custom ship style sets having the wrong strategic icons”. I’m not sure if this is related but I’d like to highlight this issue in the ship designer. Technically, you don't have to have tourism researched, just do anything that gives a consulate a level bonus, like building 2 of them next to each other. I'm thinking that they meant to add just 0.2% (1/5 of the value if you built a port of call or Import export center) not a full 2% (twice the value of the actual tourism improvement). I've modded it locally run with the .2% (value of .002) and that seems to be more reasonable. Working hard at stacking influence bonuses, I've got a consulate to 1.6% tourism, which doesn't feel OP. I like the concept, I just think someone typoed it. The current default means that income from tourism far outweighs everything else. .2 seems fair. It is much more difficult to raise cash these days. I noticed the consulate thing as well. Just build two of them next to each other and it's a ton of money.